gridComm provides a complete smart light solution that creates a network over a city's power lines, connecting sensors capable of instant communication. 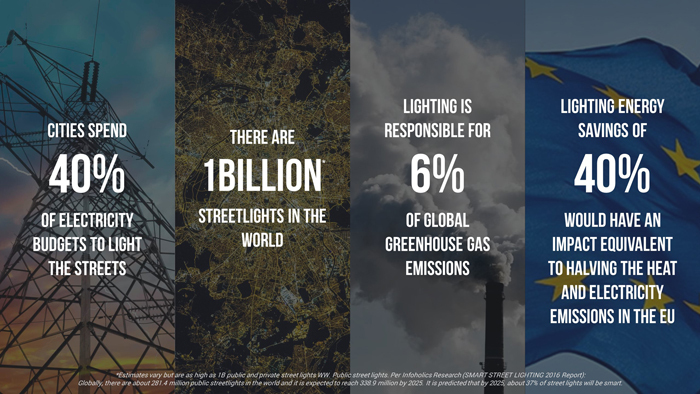 We then use that to connect thousands of sensors to measure weather, pollution, traffic, and more, with street light control software that saves millions of dollars in electricity and maintenance costs. Intelligent lighting operations alone can shrink a city's annual electricity consumption by as much as 40%.Granting unprecedented control, a smart city network enables hundreds of thousands of IoT sensors to communicate and deliver detailed environmental data in real-time. There are 50 billion IoT devices predicted by 2020, and our solution is ready to connect with all of them to form a holistic, future-proof foundation for your smart city. Linked together, our proprietary sensors form a city-wide central nervous system. Their wireless-augmented power line infrastructure paves the way for instant analytics of weather, pollution, parking and traffic data through environmental sensors and third-party technologies that can help cities to become significantly more cost and resource efficient. Inefficiencies arise when systems are not interconnected. Being able to monitor a city’s pulse with real-time data means that hardware failures and faults can be immediately detected and even anticipated in advance. Removing the need for human engineers to perform scheduled physical checks on-site can also greatly reduce a city’s repair and maintenance costs while optimizing the lifespan of its hardware. Removing the need for prohibitively expensive new infrastructure, gridComm’s solution ‘piggy-backs’ on a city’s existing power lines. We have solved the long-standing problem of signal interference from electrical noise by adding a layer of wireless connectivity on top of 18 redundant channels. This allows us to provide the world’s most reliable smart city network solution with complete technology ownership from sensors to gateway and software. The two-way communication is made possible when a sensor sends data to gridComm’s back-end gateway device, which functions like a ‘brain’ and reliably sends back instructions to the sensor. gridComm creates a network across a city's existing power lines and use this network to connect street lights and sensors. In combination with gridComm's partners, we securely connect street lights, and smart city sensors. "This is all about disrupting the way cities manage infrastructure. We start with street lights. There are a 1 billion street lights in the world. Over the next 5 years 40% will upgrade to connected street lights. But street lights are just the start. Our network spans the entire city. 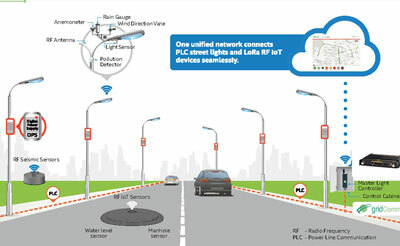 Once the street lights are connected, we can connect thousands of sensors to measure weather, pollution, traffic etc. with the data communicated over our power line control network."